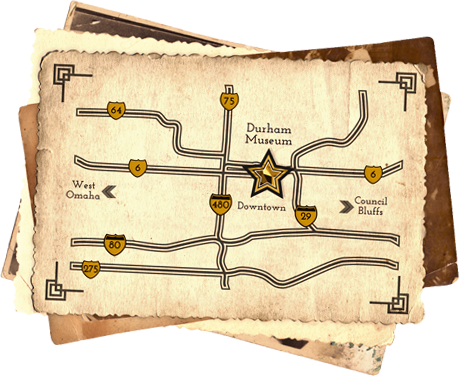 The Durham Museum will open a new interactive STEAM-based (Science, Technology, Engineering, Art, and Mathematics) experience for learners of all ages Thursday, September 27. The new space, called The Platform, is on the lower level of the museum in a 82’ x 12’ area located in between the full-size passenger cars, caboose, and steam locomotive enclosed on what was originally track one in the Union Station terminal. The area features an industrial, workshop-like aesthetic, with a focus on creating, building and innovating. The area will be a flexible, ever-evolving space. Current features include a brick building wall, magnetic wall with marble tube run, train table, oversized maps of Omaha neighborhoods and new counter height tables that look out onto the active railyard. Tables can be reconfigured to accommodate special programs and presentations, and the workstations will be periodically updated with new activities and experiences. The launch of The Platform was made possible by a $20,000 gift from U.S. Bank’s Community Possible initiative. In 2018, U.S. Bank and its 74,000 employees are making work and play possible for one million people by helping young people learn how to start their own businesses, refurbishing play spaces and providing $6 million in Play grants to nonprofit organizations across the country. U.S. Bank employees worked alongside Durham staff members to install the space. This is one of the bank’s signature projects, which includes similar type spaces in Cleveland, Cincinnati, Columbus, Denver, Milwaukee, Seattle, Boise and Minneapolis/St. Paul. Produced in part by a grant from Nebraska Tourism Commission.